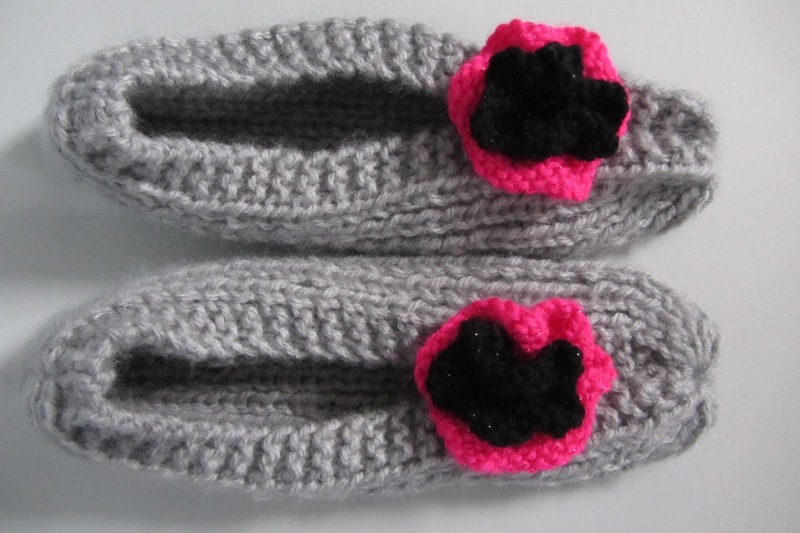 A knitting pal gave me a pattern for slipperettes made using chunky yarn and I knew immediately of a local Good Cause I support that could possibly make use of such footwear. 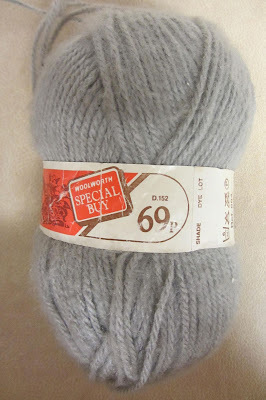 I sorted through my stash for suitable yarn and found a ball of 100% brushed chunky. I don't know how long I have had it but the price on the ball band is 69p! The pattern is an easy one. 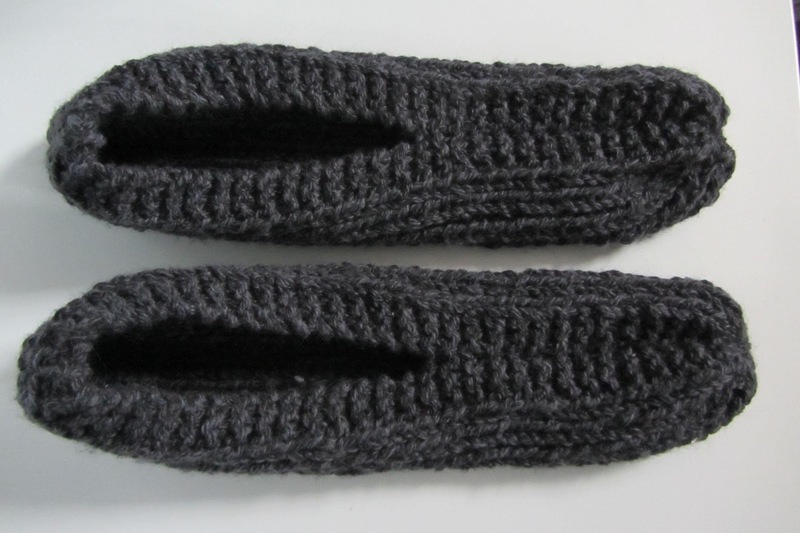 Cast on, work until the knitted fabric length is the same as the foot length. Cut the working thread and thread this through the stitches and pull to close the hole. Fold the cast on edge and stitch to form the back seam. Join together what were the side edges from the toe upwards for a suitable length to form the instep. 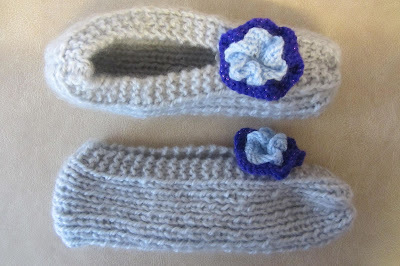 The slipperettes were worked in single rib with three garter stitch stitches at each side edge. 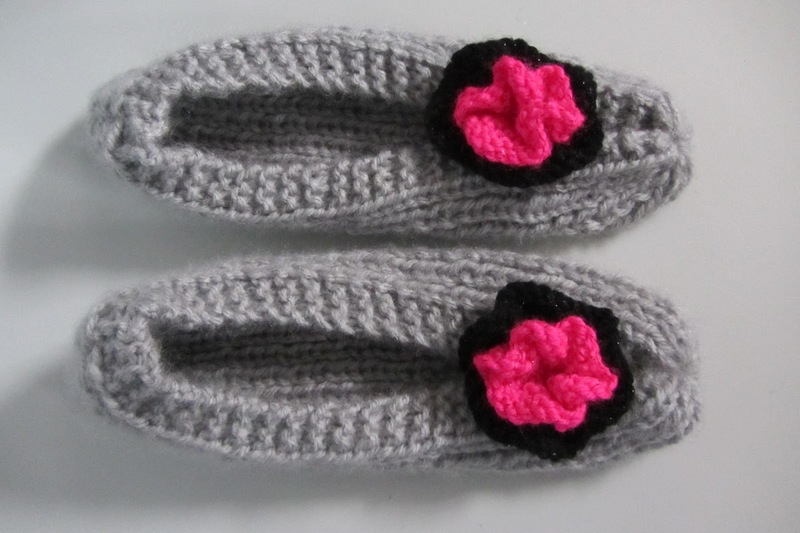 The same ball made the first two pairs of slipperettes. The rosettes, made using double knitting (DK) glitter yarn, were not in the pattern. I then bought a ball of acrylic brushed chunky yarn from a charity shop to make a third pair. 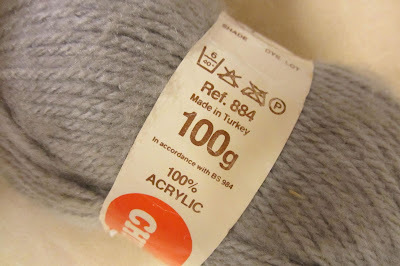 The yarn was thicker than the previous one and only one pair could be made from it. All three of the above pairs had a 9½ inch (24 cm) foot length equating to a shoe size 5 to 6. 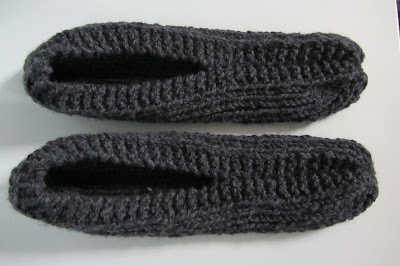 I was gifted a ball of a soft charcoal grey or black (depending on the lighting conditions) unbranded (meaning that it was without a ball band) chunky yarn which was used to make the fourth pair. There was enough of this to make a large size. 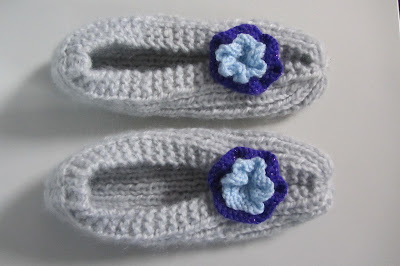 No rosette decoration on this pair as the 11½ inch (29.2 cm) foot length, equating to shoe size 10½ to 12, and the colour suggest that these slipperettes would probably be worn by a male. A loosely spun acrylic chunky yarn was also gifted to me which I used to make the fifth pair of this batch. The foot length was 8½ inches (21.6 cm) equivalent to shoe size 2 to 3. There wasn't enough yarn to make the foot length longer. 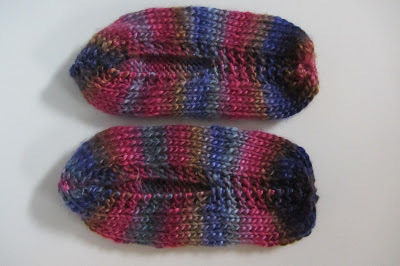 This pair was worked in stocking stitch with a border of three garter stitch stitches at each side. Stocking stitch was thought to show the self-striping of the yarn better than rib. The slipperettes were donated on Saturday 31st March 2018 and gratefully received. I now have much chunky yarn that has been gifted to me and chunky yarn I have bought, mainly from charity shops, to make more but keeping to shoe size 5 to 6 where possible as agreed with the receiving Good Cause. I am grateful for the gifted yarns for which I gave a donation to local Good Causes I support. 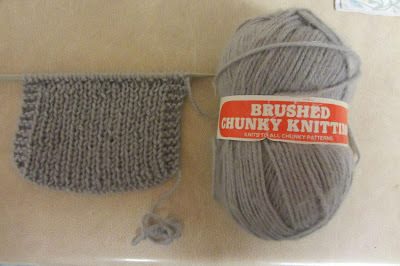 Surplus chunky yarn ~ for example, when there isn't enough yarn remaining in the ball to make a pair of slipperettes ~ will be used to continue with a ten-stitch blanket I started several years ago. When finished, the blanket will be donated. Thank you for visiting my Paulineknit blog today. Your comments are welcome. If you enjoy knitting please visit and Like my Facebook Page www.facebook.com/Paulineknit. Follow Pauline Hornsby's board Paulineknit - a life of hand knitting on Pinterest. Hand Knitting Expert - still wishing to be a hand Knitting Designer, Author and Tutor after having to retire.